Jason Calacanis is an entrepreneur, angel investor, the host of This Week in Startups podcast and, now, author. He opens with the criticisms often lobbed his way—that he’s a “fraud,” “a brilliant hype man,” that he’s “lucky” —and he readily agrees with all of it. He’s a C- student from Brooklyn who created success in Silicon Valley through investing and now he’s sharing how he did it. Rather than pulling up the ladder behind him, Calacanis draws readers a map, shares the methodologies that brought him success, and points out the pitfalls. The book, while a fast, entertaining, and useful read, isn’t all virtue: It also settles old scores and absolutely will help his business and his deal flow. Calacanis argues that angel investing is a great gig: For the cost of an investment, angel investors get to engage with super-smart entrepreneurs and their world-changing ideas. They get periodic intellectual workouts and can then send the founders off to do all of the hard work. What’s not to love about that? According to Calacanis, an angel investor needs to be located in Silicon Valley (see Chapter 5), have $510,000 to invest, the ability to lose every cent of each investment (e.g., a bigger portfolio or stash of cash elsewhere), and a lot of risk tolerance. Two concepts in the book generated particularly-interesting discussions for our company. In the first concept, Calacanis discusses becoming an angel investor with little or no money and instead adding value to a company in exchange for basis points. We realized that we could be providing advice and guidance to third-wave companies—companies connecting our physical and digital worlds in a way that often requires updates to laws and regulations to keep pace and make room for these revolutionary ideas (e.g., Uber and Airbnb). Why has this founder chosen this business? We are our target customer and we developed Arena because the software on the market does not adequately differentiate or motive us to complete some of our usual projects – ‘solve for world peace’ and ‘pick up toothpaste.’ Based on decades of experience and the latest research, Arena gives users a way to see and manage their day that’s unlike anything else on the market. With Arena, you can have a better day! How committed is this founder? We are completely committed to a world in which everyone thrives. We make choices daily, hourly to ensure that outcome for ourselves, our employees and our customers. What are this founder’s chances of succeeding in this business – and in life? Our company has thrived for twelve years and provides the base from which we are launching Arena and our other software products. What does winning look like in terms of revenue and my return? This question is not applicable because our company is not seeking investment. Calacanis concludes by admonishing the reader that “life is random, but luck isn’t” and implores readers to “do the work”: Angel investors must network, must be a resource in the industry, must research emerging markets, research possible competitors, understand new ideas and the nature of innovation, provide value to their companies, and learn lessons about what worked when and what didn’t. If you do that, if you do the work, invest the cash and tolerate the risk for over a decade, Calacanis believes you’ll have success. Calacanis, Jason. 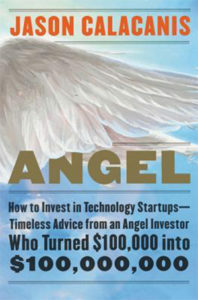 Angel: How to Invest in Technology Startups – Timeless Advice from an Angel Investor Who Turned $100,000 into $100,000,000. HarperBusiness, 2017.